Most people think that dark under-eye circles are caused by staying up late watching monster movies, or having that last drink the night before, or sitting up with your laptop trying to finish the quarterly report. Most people think that their behavior is somehow linked to dark under-eye circles. Dark under-eye circles are actually a by-product of the very same mechanism that produces bruises. Changing your behavior will, in almost every case, NOT get rid of your dark under-eye circles. Dark under-eye circles begin in the capillaries, the tiny blood vessels that web the delicate skin around the eyes. Now, your capillaries are so small that red blood cells sometimes have to line up, single file, to get through. Frequently, red blood cells get lost and wander into the surrounding skin. This isn’t a problem–it happens all the time–and your body has a mechanism to mop up these escapees. Enzymes in your body break down the red blood cells, including their hemoglobin (the molecule that gives them their distinctive red color). 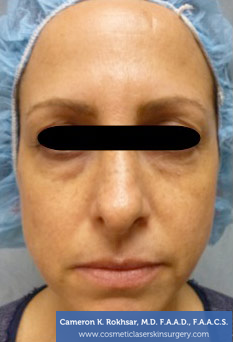 How Do I Get Rid of Those Dark Circles Around My Eyes in Manhattan? If you’re plagued by chronic dark circles, talk with a dermatologist about more aggressive options. 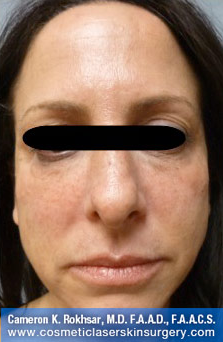 For patients with excessive pigmentation, lightening creams, chemical peels or laser resurfacing may be an option. 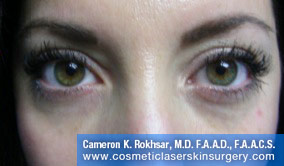 Lightening agents, such as hydroquinone acid, work gradually by training under-eye cells to produce less pigment. Non-prescription strength lighteners are available but can take two to three months to effect a noticeable improvement. Chemical peels and laser resurfacing remove layers of damaged skin and help to make pigmentation less visible. 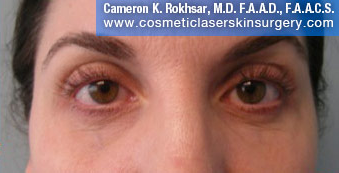 Each option comes with cautions, and Dr. Rokhsar can determine the best approach for your skin. 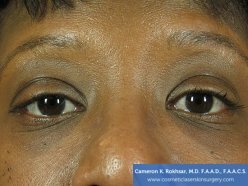 Bone structure: If you have deep-set eyes, shadowing contributes to the dark color under the eyes. Your best bet: camouflage. Look for concealers with yellow undertones, which counteract the bluish cast to under-eye circles. 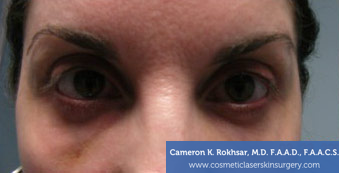 Pigmentation: Genetic hyper-pigmentation is the most treatable form of dark circles. 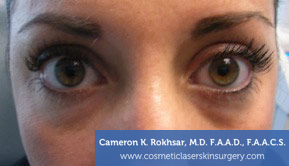 Your best bet: chemical peels or laser resurfacing. 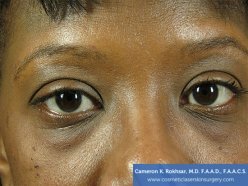 Vasculature inflammation: Late nights, allergies and nutritional deficiencies can enlarge the blood vessels beneath the thin under-eye skin. Sounds cliché but drink that water, get your beauty sleep, eat a healthy diet and avoid cigarette smoke.